The pre-election campaign finance reports were due today. I’m happy to say I turned mine in on time. A mere 9 pages. Compare that to the 43-page book turned in by the Whaley campaign and you’ll start to understand. 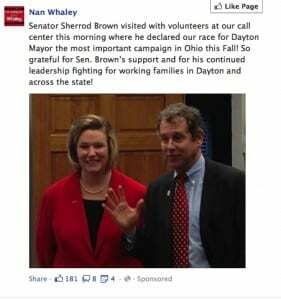 I’m losing respect for Sherrod Brown too. As if she is facing a real threat to democracy in AJ? C’mon. Williams, Mims- both raised more money than I did. They also spent more than I did. Somehow, buying food, wine, a lot of ads in programs, donating to other campaigns, donating to churches- is expensive. They didn’t hang any basketball nets, or clear any basketball courts. They didn’t hang three new rims at Princeton Rec- and really- they didn’t say a whole lot on the campaign trail. I had 3 fundraisers. I spent almost all my money locally. I did my own design, a lot of my own web work, didn’t pay any staff. Didn’t buy anybody lunch. I knocked on a lot of doors myself. I videotaped all the events- and posted them online. I helped David Greer, Gary Leitzell, Hazel Rountree with campaign materials and with websites. I started up the www.hoopsdayton.org site that I hope to grow into a place to run basketball leagues and coordinate tournaments in the future. For now- it’s working as a great website for a lot of independent Dayton Businesses- barber shops, who didn’t have websites- but, are now being found in Google. I had 2 DPS kids as interns this summer- and they made an amazing video about the hoops initiative. If I lose, I think our city still won. If I win- I know it’s because I did the right thing and never sold out. Tonight I was at one of the most interesting and informative candidates’ events ever- run by Preservation Dayton. I’ll have video up on Saturday if all goes well. I’m incredibly tired, and still need help with distributing literature and working the polls. I’d like to thank all those who donated- and those who’ve helped. But- the biggest thanks is to those who’ve hollered out of cars- “thanks for putting up nets, we’re voting for you” or to the kids who’ve thanked me on the courts. Your thanks meant the world to me. I’ve run a bunch of times over the last 20 years- and never have I been thanked so many times. I’ve been asking friends, supporters and people who know me to do testimonials. Here’s one from UD Women’s basketball coach, Jim Jabir- it’s short. It’s not your normal endorsement- but, I think people stopped expecting normal from me long ago. Did you notice that Bob Taft and his wife both gave several payments to Nan? @Daytonman- yes I did. There were other R’s donating as well. But, since Taft works at UD now- we can read it as the UD lobbying for more tax breaks and not getting billed for police protection for riots…. Thats quite a jump you are making. So if WSU professors are donating to her does that mean they are lobbying for the same? It was 325.00 between him and his wife. If that buys you influence then we are all fucked. Rewards for everybody… except the voters. It hurt seeing my former Econ prof giving her money- but, then again, he’s head of the union there. Rudy is 10x time person you will ever be. I don’t know Rudy, but I know his wife. I would give him the benefit of “voting his conscience” over towing the union line. And @Daytonman are you sure 10x, or only 8.5? And what are we in competition for?